If you’ve read our article about how carbs cause acne or why the ketogenic diet is one of the best diets for clear skin, you might think that peanuts, and more importantly, peanut butter, is safe for acne-prone skin. Just like other nuts, it’s a healthy fat, right? Peanuts are one of the worst foods you could eat for acne-prone skin. They contain high amounts of omega-6 fatty acids, which can contribute to inflammatory acne. They also contain dangerous lectins which can damage the gut and trigger inflammation. On top of that, peanuts are usually roasted in inflammatory vegetable oils. Peanut butter isn’t any better and often contains added sugar or vegetable oils. A diet high in omega-6 fatty acids and low in omega-3 fatty acids can lead to chronic inflammation1https://www.ncbi.nlm.nih.gov/pubmed/29610056, a condition where your immune system becomes overactive and ends up treating every little acne infection like a huge threat. The end result? Redness, swelling, and protrusion – a pimple! 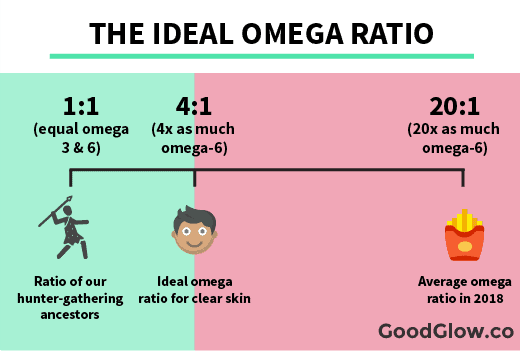 The “omega ratio” is the amount of omega-6 fats (inflammatory) you eat compared to your omega-3s (anti-inflammatory). You want to get as close to a one-to-one relationship as you can, meaning equal amounts of 3s and 6s. Unfortunately, most Americans eat 20 TIMES as many omega-6s as omega-3s. No wonder acne is so common! To put it into perspective, you’d have to eat over a half pound of macadamia nuts, close to 2,000 calories, to get the same amount of omega-6s. This makes peanuts extremely hard to stomach if you struggle with inflammatory acne, even in moderation. Lectins are compounds that plants use to protect themselves. Just like animals, plants develop natural methods of protection to avoid getting eaten. Unlike animals, plants can run, jump, or swim away from their predators, so they develop antinutrients, like lectins. Lectins cause acne by damaging the gut. Our body isn’t able to break down lectins. After ingesting them, they travel through the digestive system fully intact until they reach the intestine. There, they can weaken and damage the lining of the intestine. Eventually, if the intestine is weak enough, these lectins and other compounds can pass through the wall and trigger inflammation, and with it, inflammatory acne. Most plants contain lectins, and many of them are no big deal. Cooking, soaking, or sprouting will usually get rid of them. This is not the case with peanuts – the primary lectin found in peanuts, peanut agglutinin, is similar to gluten found in wheat. It is one of the most damaging and resilient lectins out there. 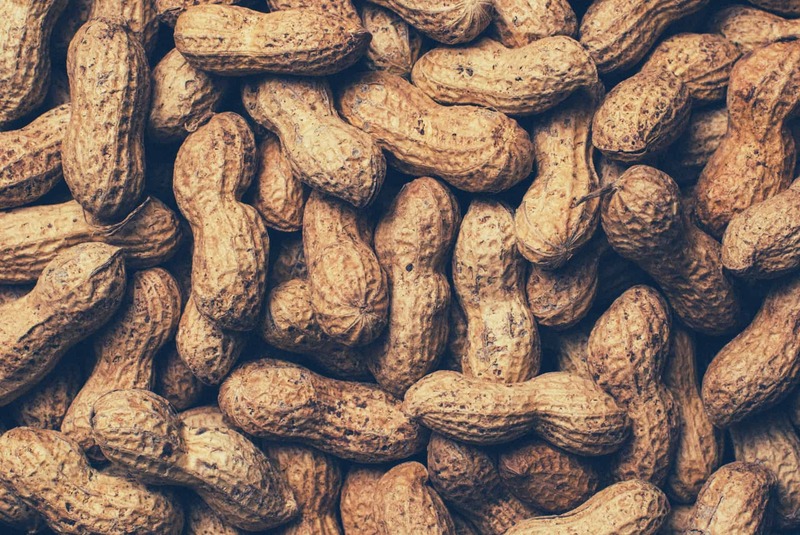 Worse yet, peanut agglutinin is among the most allergenic lectins out there (which is why so many people are allergic to peanuts). Food sensitivities and allergies can also trigger inflammatory acne. The end result is that peanut lectins are much more like to damage your gut and immune system than other legumes. Unfortunately, those freshly roasted peanuts you’re chowing down on probably have a double dose of inflammatory omega-6s. Unless you’re eating raw or dry-roasted peanuts, they’re usually fried in vegetable oils, like soybean, sunflower, or canola oil. These oils are extremely high in omega-6 fatty acids, and very sensitive to heat. This combination makes roasted peanuts even more likely to cause inflammatory acne. Peanut butter isn’t any healthier or safer for your skin than peanuts. The key ingredient in any peanut butter is still, you guessed it, peanuts. So just like regular peanuts, peanut butter is high in inflammatory fats and lectins that cause acne. On top of that, most peanut butter you’ll find at a store contains molasses or sugar, which can trigger a cascade of acne-causing hormones. They’re also loaded with hydrogenated vegetable oils, like rapeseed and soybean oil. These vegetable oils have extremely high amounts of inflammatory omega-6 fatty acids. Peanut butter without these oils is extremely pro-inflammatory, so once you add these oils you’re getting a double dose. There are better peanut butter options out there, but overall it’s safer to go with something like natural almond butter. 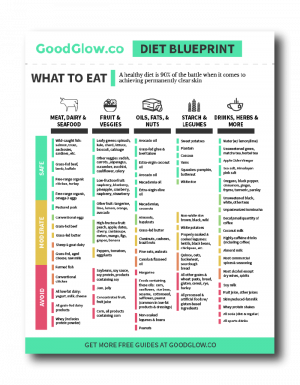 The GoodGlow Shopping Guide contains a full list of vegetable oils and additives to avoid for clear skin. Overall, peanuts and peanut butter are pretty bad foods to eat when it comes to acne. 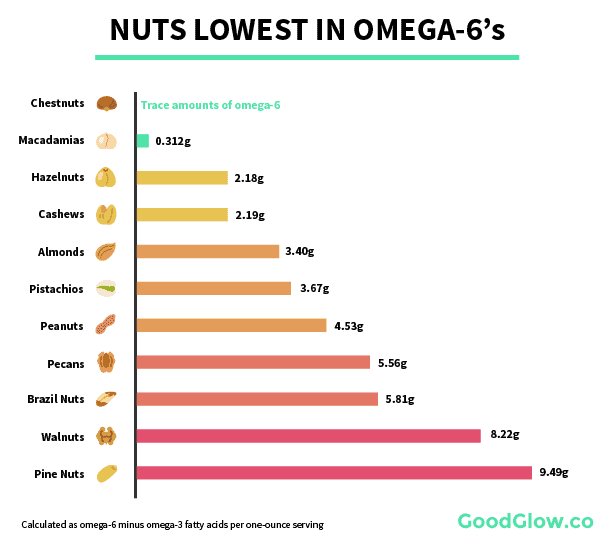 Unfortunately, many nuts are just as high, or sometimes even higher in inflammation-causing omega-6 fatty acids. Dry roasted or raw almonds and almond butter is usually a better choice – almonds are high in skin-clearing vitamin E and prebiotics, but still has it’s fair share of omega-6. Allergies to almonds are also pretty common. Overall, your best bet for replacing peanuts and peanut butter with an acne-friendly alternative is macadamia nuts, and homemade macadamia butter. For a full breakdown, see The Best and Worst Nuts for Acne for better alternatives to peanuts, or check out our one-page Diet Blueprint. There are healthier, better options when it comes to nuts, including macadamias, almonds, hazelnuts, and chestnuts.